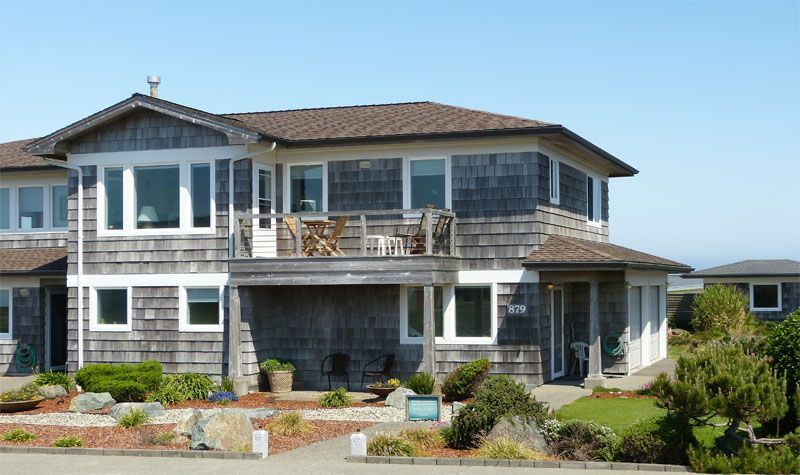 2BR, 2 BA Ocean-view Vacation Rental Bandon, OR, USA-sleeps 4. 4-night minimun. This ocean-view, 2-level townhouse sits on Coquille Point, one of the most visited ocean/wildlife viewpoints on the southern Oregon Coast. A short path leads to a park that wraps around the point and overlooks the ocean beach, shoreline coves and seastacks that comprise the Oregon Islands National Wildlife refuge. Well-maintained stairs lead down to the Pacific Ocean with miles of beach walking, tidepool exploration, agate hunting, kite flying, and whale watching in season. The ocean and seastacks crown the view from your window and seabirds are numerous, including cormorants, gulls, rare tufted puffins, common murres and pigeon guillemots. Surf watching is popular during storms. The open-floor plan of the upstairs living area includes a full kitchen, dining area, living room with gas fireplace and pull-out queen sofa which leads out to a viewing deck. Adjacent to the living area, the fully-furnished kitchen features a skylight, tile countertops and floors, and a complete suite of appliances including a gas range, refrigerator with ice maker, microwave, dishwasher, and disposal. Also on the upper level is a King-bed-furnished bedroom (beds can be converted to XL Twins) and a continental bath with shower/tub. The ground-floor master King bedroom (or XL twins) has its own patio for a quiet getaway. The bedroom's accompanying walk-though wardrobe and double sinks with shower/tub complete the master suite. Also on the first floor is the separate laundry room and access to the attached two-car garage. Enjoy a picnic in the common garden area or on the patio outside the master bedroom, the upper deck or lower patio off the main living area. Leisurely gaze at our new Dry Creek Contemplation Garden from the upper deck or lower patio or enjoy the panorama of garden, park and ocean horizon from one of our garden benches. Take a stroll on the maintained private and public paths to the wildlife viewing area or go down the wide stairs to the beach. The shingle-style architecture blends naturally with the setting, looking just the way you may have imagined a coastal ocean-view home should. Fully furnished and well appointed, the townhouse also subscribes to satellite DirecTV. There are 3 TVs (one HD), VCRs, DVD player and broadband internet. It's the vacation home solution for family and friends. The sandy beach will challenge any child's imagination in the construction of a sand castle. Every member of the family can enjoy the fun of beach exploration or kite flying. Crabbing and fishing are nearby. Our guests acclaim the townhouse as very clean, well-maintained and very comfortable with all of the features of home and more. Most all wish to return soon. There is no traffic noise at night to interrupt your sleep, just ocean waves breaking on the beach plus a foghorn during stormy nights. World-class Bandon Dunes Golf Course is 10 minutes away. Crabbing from the old-town docks, fishing in the rivers, kayaking and canoeing on the rivers and lakes, and whale watching are popular seasonal pastimes. Storm watching opportunities abound in winter as the high surf frequently splashes over the offshore seastacks. Old Town Bandon offers a variety of shops, a modern public crabbing pier and boat launch, and plenty of dining options. Ocean fishing charters are available as well as sea kayak trips in Charleston Harbor to the north, South Slough Estuary, and various lakes and rivers in the area. Nearby Cape Arago is home to seal and sea lion populations at Simpson Reef, as well as Shore Acres Gardens which are lovely in the spring and decorated and lit for the winter holidays. Horseback riding is popular on the beach at sunset. Some of the best windsurfing on the Oregon coast is just a short drive to Floras Lake. Other hiking opportunities abound on numerous trails in the area. 3 HDTV flat screen. All receive satellite DirecTV with movie, sports, music packages. Alcove with pull-out table for puzzles. Our Zen Garden is ready for you to enter when you wish to relax on one of the benches after scouring the beach for agates or tire of watching the surf break on the seastack rocks offshore. Available for hire in Bandon Boat Basin and also in Charleston Boat Basin north of Bandon. Children's sand pails, sand shovels, sand molds, frisbees, beach chairs and more are stored in the garage. World-class Bandon Dunes and local Bandon Crossings are nearby. Several more courses are within the county. Delightful accomodations. Clean, quiet, lots of natural lighting, and comfort. Well appointed with just about anything you'd need to enjoy the coast. The townhouse has great access to the beach and the bluff overlooking the ocean. As a place to begin an adventure, or simply to rest and recharge, the townhouse is an excellent choice. I really enjoyed my stay. The house and kitchen especially had everything I needed to make stay relaxing. I hope to visit again soon. If you are going to be in the Bandon area look no further. Marilyn & Rick's place is amazing. Location cannot be beat...just steps from the beach with a fantastic walking path and just minutes into town. The townhouse is beautiful and fully equipped with anything you could possibly need. Would definitely return without hesitation. Thank you Marilyn & Rick for you kind hospitality. Great getaway weekend in a lovely rental! My wife and I have stayed in rentals all over the world and this was one of the best, esp. for the money. Totally clean and well cared for (bathrooms and kitchen too), it had the feel of someone who truly cared about her guests and the unit as a whole. The kitchen was well stocked, as were the bathrooms, and it was completely quiet, except for the foghorn, which we got used to. But the real treat of course were the views in three directions, and the close proximity to the beaches. The TV had great satellite reception with many channels although we mostly watched things on our laptops (Game of Thrones, etc.). The owners responded promptly to every communication, and made it clear that they would be available to help us with anything during our stay. We would stay there again in a heartbeat! The house was incredible! The hosts provided everything we needed, including shampoo, soap, laundry items, lots of sheets and towels, & kitchen items. We enjoyed the space which was perfect for our family, and will definitely stay again! Thank you for a nice place to gather and rest. The townhouse is on the Coquille Point headlands, 2 miles south of the center of town and adjacent to Oregon Coast National Wildlife Refuge, that wraps along the point with excellent views of the ocean, beach, seastacks and numerous sea birds. From your window or deck the view of the ocean and the seastacks is unobstructed to the west but also can be partially viewed over rooftops to the north. A short path to the Park and easy, sturdy stairs down to the Pacific Ocean gives you miles of beach walking. Rare puffins, common murres, oystercatchers, pelicans, Aleutian geese and guillemots can be seen on the seastacks during the breeding season. World famous Bandon Dunes Golf Course is minutes away. Agate hunting, tidepool exploration, kite flying, horseback riding and beach hiking are popular all year while crabbing from the old-town docks, fishing, kayaking, canoeing, storm and whale watching are seasonal. CALL Marilyn OR Rick at 541-347-1686 FOR ACCURATE PRICING or visit coquillepoint dot net If cleaning time exceeds 3 hrs, then a fine of $15/half hr will be taken out of the damage deposit. For stays of 2-3 weeks, the cleaning fee will be $135; $150 for stays of 1 month or longer. Coos County Public Health Est. No. 0610213 Comment: 1-week minimum. No dogs or smoking; there will be a $75 fine for either. Check-in time 4 pm. Check-out time 10 am.